Workbox Staffing located at 1930 E. Apple Ave. Suite H is hosting Trunk or Treating! Come to the Book Nook & Java Shop 8744 Ferry St., Montague for Trivia Night! Test your wits with your team while enjoying food, fun and prizes. For more information, call 231- 894-5333. The Book Nook & Java Shop located at 8744 Ferry St., Montague invites you to enjoy coffee accompanied by tunes played by Steve Thielman. For more information, call 231-894-5333. Bring the kids to Jumpin’ Jupiter Skate Center, 1775 Evanston Ave., for the “Monster Mash Boo Bash” Halloween roller skating party! Wear your favorite costume (full costume) to receive free admission, otherwise $3. You may bring your own roller skates or roller blades or rent them at the rink. Parents and children (less than 32”) are the only free spectators, all others will be charged admission whether skating or watching. For more information, call (231) 773-5538. Join the My Auto Group, 1860 E. Sternberg Rd. for some Halloween fun! This indoor event will feature trick or treating, a photo booth, coffee, donuts, cider and of course candy! This is FREE for everyone! For more information, call (231) 799-2886. Be part of The FREE Zombie Apocalypse-style game of tag at Hackley Public Library! Human players must defend themselves against the infestation of zombies with socks and dart blasters (no realistic-looking weaponry). Participants should arrive 30 minutes before event start time (meet in the lower level meeting rooms at 7:30pm) to go over rules and pick the Original Zombie. The Library will be locked up at 8:00pm, and the game will start shortly afterwards, running about 90 minutes. Bring a bandana, and either a foam dart blaster or sock (limited supplies will be available). This is for ages 16 years and up. Space is limited to 50 players. Fruitport Congregational United Church of Christ located at 9 8th Ave., Fruitport invites you and the kids to “Trunk or Treat,” It’s the hot dog dinner in the basement of the church, and then it’s the handing out of candy in the parking lot at 6:00pm. For more info., call (231) 865-3551. Come to Muskegon Community College, located at 221 S. Quarterline Rd. for a Halloween screening of the horror film “Ruin Me” as part of the ahFest Film Fest! Alexandra (Marcienne Dwyer) reluctantly tags along for a Slasher Sleepout, an extreme event that is part camping trip, part haunted house and part escape room. But when the fun turns deadly, Alex has to play the game if she wants to make it out alive. This Halloween night ahfest film will be screened at Muskegon Community College with an introduction by MCC instructor and actor Tom Harryman, who plays a part in the movie. Admission, popcorn and cider are free! For more information, call 231-777-0324. Life Change Church located at 1807 W. Giles invites you to join them for Trunk or Treat! This is a free community event for everyone in Muskegon! Bring your kids dressed in costumes to this safe and fun event! They will have lots of candy, cider and donuts, fun games, live music, and many other fall activities for your family! This years event will be at Reeths-Puffer Middle/Central Elementary Schools. For more information visit www.mylifechangechurch.tv or call 231-766-5599. Pigeon Hill Brewing Company presents Hoppy Way Ipa, a beer that gives back! $1 per beer during this launch party goes to the United Way of the Lakeshore to support local programs in education, income and health. For more information, call (231) 375-5184. November 1 @ 10:30 am – This is Kids Day! Come to the Book Nook & Java Shop located at 8744 Ferry St., Montague for “Jazz Night” with Third Coast Ensemble! For more information, call (231) 894-5333. Friday, November 2 from 8:00am – 8:00pm and Saturday, November 3 from 8:00am – 5:00pm, you are warmly invited to Wasserman’s located on 1595 Lakeshore Dr. for their Holiday Open House! Enjoy festive treats, shopping, hourly prize drawings and fun. For more information, call 231-755-6536. Come to the Book Nook & Java Shop located at 8744 Ferry St., Montague for pianist David Moul! He performs classical, jazz, and contemporary styles, but primarily plays for church and praise & worship services. For more information, call 231-894-5333. Visit the Frauenthal Center as the West Michigan Symphony presents “Scheherazade Showcase!” Normally they’re at the back of the ensemble, but this time they’re putting the marimba and tuba in the spotlight. You’ll be amazed by their talented musicians as they showcase their instruments, from high to low end! Nearly everyone gets a solo in Scheherazade – including violin, clarinet, oboe and horn to name a few. Single ticket prices are $24-$60. Student tickets are $10. Call 231-726-3231 ext. 223 for tickets and more information. Come to the Book Nook & Java Shop located at 8744 Ferry St. for Acoustic Oasis! Phil Petersen and Glen Miller are two guys who love playing music. Inspired by such artists as CSNY, Simon & Garfunkel, The Beatles, Jack Johnson and Ray Lamontagne, he has created a playlist of covers featuring 6 and 12 string guitars, mandolin, ukulele, banjo, clarinet and harmonica. For more information call 231-894-5333. Come to The Block located at 360 W. Western Ave. for Jonathan Holden! In a showcase of West Michigan Symphony talented musicians, principal clarinet Jon Holden has brought together an ensemble featuring Marissa Olin, flute, Marat Rakhmatullaev, principal bassoon, and more. Call 231-726-3231 ext. 223 for tickets and more info. Doors and bar open at 6:45pm. Saturday, November 3 from 9:00am – 3:00pm, come to Mona Shores High School located at 1121 W. Seminole Rd. for their Holiday Arts & Crafts Show! Over 180 booths of handcrafted items from all over Michigan will be located in the Sailor Center, Hanichen Gym, auxiliary gym and cafeteria. Breakfast, lunch and snacks will be available for purchase. Admission is $1 and parking is free. For more information, call 231-332-8230 or visit www.monashores.net. Saturday, November 3 from 9:00am – 2:00pm, you’re invited to Trinity Lutheran Church located at 3225 Roosevelt Rd. for their Holiday Bazaar! For more information, call (231) 755-1292. The Greater Muskegon Woman’s Club located at 280 W. Webster is hosting an Art Extravaganza that includes a Juried Art Show, an Artwork Sale and a Second Chance Art Auction! Proceeds from this event will go to the Raise the Roof campaign to assist in the replacement of the roof at the Greater Muskegon Woman’s Club. The event is free and open to the public. Light refreshments will be provided. For more information, call (231) 725-9220. Located inside Sherman Bowling Center, 1531 W. Sherman Blvd.Tickets are $10. For more information, call 231-755-1258. Sunday, November 4 at 3:00pm, come to the Frauenthal Center for “The Music of Autumn” presented by the Muskegon Community College Collegiate Singers. Tickets are $8.00 for adults or $2.00 for students and children. For tickets or more information, call 231-727-8001. The White Lake Music Society will present four dynamic lectures entitled “The Swan Series!” Join host Robert Swan as he shares many of his insights, experiences, and expertise gleaned from 36 years of performing in the Chicago Symphony Orchestra under such famed conductors as George Solti, Daniel Barenboim, Leonard Bernstein, Leopoldo Stowkowski, Claudio Abbado, and many others. Each lecture will be held at the United Methodist Church located at 117 S. Division St., Whitehall at 4:00pm. The suggested donation is $7 at the door. Sunday November 4, it’s time to fall back and set the clocks back to mark the end of daylight saving time. This entry was posted in Calendar of Events on October 29, 2018 by editor. Letter to the Editor – Save Our Library! Why the November Vote Matters to Fruitport! In 2015, Fruitport residents hit the polls to show the MADL we meant business when it came to providing funds to our library. Our voters approved the separation of the Fruitport Library from the MADL in order to establish a library of our own. The Fruitport Library began the process of becoming its own library district. In May of 2016, our library got approval for a “new,” “additional” millage of .75 ($0.75 on each $1000 taxable value) for operating costs for 3 years beginning in December of 2016 and ending in December of 2018. THIS CURRENT MILLAGE WILL EXPIRE THIS DECEMBER. On our November ballot, we will see the millage for the Fruitport District Library, which is the first time the Fruitport Library will be on the ballot as the Fruitport DISTRICT Library. The millage that voters are being asked to approve this year is NOT AN ADDITIONAL MILLAGE. It is actually a RENEWAL of the original amount of .75 mills. The words “new” and “additional” are legally necessary to have on the ballot because of the name change and because of a legal technicality based in our library’s previous request for a millage in May of 2016, but there is NO ADDITIONAL FUNDING being taken from our taxes, only the original .75 mills. IF WE DON’T VOTE TO FUND OUR LIBRARY, WE MIGHT SEE OUR LIBRARY CLOSE. We as voters, library staff and volunteers, board members, and all residents of Fruitport, did not work so hard to fund our library just to see it collapse after only 3 years, did we? If the Fruitport District Library closes, residents who are members of the Fruitport Library won’t have access to library services until they join another library outside Fruitport. Local residents who join other districts may be charged a non-resident fee by their new libraries for their new library cards. Some libraries do not have non-resident programs at all. But if we vote to continue funding our library here in Fruitport, the Fruitport District Library can remain funded and continue providing free and inexpensive library services to Fruitporters for the next 10 years, that’s 2019-2028! Our library’s board members are not being paid for their hard work. The “Friends of the Fruitport Library” contributed over $400, personally, for a postcard campaign that provided information on the millage for the August 7th Primary vote. However, because enough people weren’t reached with the RENEWAL news, August voters didn’t realize the importance of their “Yes” vote. Voters may have believed their property taxes would be raised to a point even higher than the amount necessary to support the 1.25 mills the MADL was requiring for its funding. Then, this thinking would have been a huge mistake. Now, thinking like this will be disastrous, since we may not get another chance to vote on this millage for a long time. THE .75 MILLS OUR LIBRARY IS ASKING FOR WILL NOT INCREASE OUR PROPERTY TAX AT ALL. As a result of the misunderstanding between our Fruitport District Library and the general public of Fruitport, our library proposal was voted down in August and lost by 90 votes. 90 votes between 4 precincts! Our library, the jobs of the good people who run it, and the many services and programs it provides, will hang on our decision to vote for the renewal of funding for the library we worked so hard to create. Public information about the FDL vote in the November 6th Midterm election is available on the Fruitport District Library website under the heading “November 2018 Millage,” here in our Fruitport Area News, and especially at our very own Fruitport District Library. Information is also available on the 3rd Wednesday of the month, October 17th, at 5:30pm, when the library board meeting is held at the Township Hall. An open discussion on the millage will be held that will then lead into the board meeting itself. The library will also be holding a book sale on the week leading up to the election, November 1st-6th, where information about the millage will be available and staff will be able to answer questions you may still have. Public information can be distributed by citizens of Fruitport, and by our library. But only citizens who do not work for the library can encourage others to vote “Yes”. Information can be distributed at the polls 100 feet or farther from the polling place. Watch your ballot carefully: the library’s vote is listed last of all on our ballots and, in some cases, on the back of the ballot form. We have to vote “Yes” for our library’s millage on November 6th if we want to see our library survive for the next decade’s worth of Fruitport residents and their children. We worked hard to get our library, and we have to put in the voting power to keep it! This entry was posted in Letters to the Editor on October 29, 2018 by editor. • Vote yes for no increase! When I first moved to Fruitport about 10 years ago, I immediately fell in love with the charm of the village. I quickly discovered the little library by the park and felt welcomed by the staff and other patrons. Two years ago there was a vote to separate from the Muskegon Area District Library and I voted against because I did not want to lose what had meant so much to me. The vote to separate passed and after a few months of transition the Fruitport District Library begin to take shape. Over the past two years I have watched our community come together to create an astounding library. Our library provides more than just a large collection of books or even the access to books from other libraries. It provides more than just a wonderful staff who are able to help us or a place for people to be able to use the computers. The library is more than just a place that provides learning opportunities with guest speakers and children’s programs. The Fruitport Dristrict Library is a place of connection, of people, of the community coming together where all are welcomed and encouraged to be a part. I am very proud of what the Fruitport District Library has become and I’m excited about our future. Please take the time on November 6 to Vote Yes to keep our library open. If the doors close, not only do we lose our library, but we lose part of who we, as a community, are. Regarding the so-called “new” millage to continue financing our Fruitport District Library. There’s really nothing new about this, although the Lansing bureaucrats who make the rules on ballot proposals would have us imagine there is. The requested millage will continue funding at exactly the same level as we’ve paid for years, with zero tax increase. To vote “No” is to vote to close Fruitport’s library, which for two generations has served the needs of Fruitport families at its home in Pomona Park. So let’s vote “Yes” to keep our library open and separate from intrusive, expensive county control. Eric Wiggin, resident of Fruitport Township, a former school librarian, a retired pastor/school teacher, and author of 16 books found in libraries across America. My name is Darlene Field and have been living in this area since 1968. We have always had a library • Sort of the heart of the Village. It’s where things happen! Recently the community decided to be an independent library. So therefore we as a community need to step up and fund our library – Books – programs, etc! So at the present time we have a millage of .75 to fund our library. At the end of the year this millage goes away. Therefore a millage is on the Nov. 6 ballot asking for .75 to fund the library. This is not new. The wording that’s “official” sounds like it’s an addition. It is not! It will be exactly the same. So please vote on Nov. 6 – for our library! Please vote “yes” for the Fruitport District Library millage on November 6th. Since state funds and penal fines provide less than 10% of our library budget, this millage is essential for the operation of our library. The current .75 mill ends on December 31st, 2018. The requested .75 mill begins on January 1, 2019. A “yes” vote for the library will NOT raise your taxes. As a former Fruitport Library director, I urge you to support our library and help us move forward. Trust me, our children and our community as a whole will benefit. Love our library. Thanks! The last minute- is it a curse of mine that I’m always doing things at the last minute? Everyone is busy, we are all trying to find a little time for relaxation, exercise, family. This letter is important to me and I’m happy to spend the time even though it’s midnight on the day of the deadline. It’s funny how I moved out of this area for somewhere bigger, where everyone didn’t know everyone else’s business, but decades later moving back to a small close-knit place sounded so perfect. Fruitport is a great place to live. I called it the “undiscovered gem of the lakeshore” when we moved here 12 years ago. I was especially proud of our residents when we voted to take control of our own library and withdrew from the MADL. It seemed like a big job to get everything up and running but the people did it. Then, I was confused when recently those same independent voters didn’t renew the millage needed to operate their library. I had to consider why and I believe a miscommunication is to blame. As I mentioned everyone is busy and trying their best to spend their time wisely. The millage was listed on the ballot as “additional“, and that made me examine it carefully even though I had read a flyer explaining it was legally required to be listed that way. The newly approved Fruitport District Library was asking for the same amount of money over the same length of time as we used to pay the MADL. I voted yes, and I will vote yes again on November 6th. I could follow up with a lot of facts about how Michigan is producing kids who need local libraries- more than half of third grade students can’t pass their State Assessment reading goals (it is true), but I’d rather just tell you my family’s experiences at our library. Our oldest is in college now, her love of reading and her time at Fruitport High School served her well, she excelled on the English portion of her SATs. The baby was two when we moved here, she is 13 now and still loves going to the library. I have to take books away from her to convince her to do other schoolwork. My little surprise was born here in Fruitport and I have the best memories of her attending the children’s programs and spending time playing at the park afterward. I still feel like we have a great place here- the people and the setting. I want to be sure everyone understands what’s at stake; the Fruitport District Library would be greatly missed by our family. The millage on the ballot November 6th is our last minute chance; please spend your valuable time voting yes. I am a Fruitport resident that would like to encourage you to vote YES on the Fruitport District Library Proposal on November 6th. The library is important to me. Many access our local library through the internet for books, music, movies and other programs, but I simply like to walk into the building and check out my books. I also appreciate that they have other walk in services such as internet use, copy services and more. The ballot language is confusing, but I understand the .75 mills we now pay expires in December 2018 and by voting YES we can continue to pay the same .75 mills for the next ten years. It is not really new or additional, but more like a renewal. Please support the Fruitport District Library “renewal” millage proposal on November 6th. A. Fruitport District Library Board has decide to put the proposal on the November 6, 2018 ballot for the residents to consider again. If it fails, there will be no funds for library operation and we will have to close it down. This entry was posted in Fruitport Library on October 29, 2018 by editor. In August, electors voted against a “new” proposal funding the Fruitport District Library. Supporters of the Library feel that the defeat was due to a misunderstanding of the proposal’s wording, which had to state that this levy is new, due to the fact the Library is, for the first time, on the ballot as “Fruitport District Library.” This “new” millage continues where the current millage ends. The current millage, expiring December 2018, levied .75 mills. The November proposal will continue to levy .75 mills for the next ten years, until 2028. With this money, the Library purchases new books and materials, provides staffing for reference, operation, and support, and maintains the facility. Fruitport District Library is a vibrant part of the community. The shelves are full of books, many published since 2015. At last count, there are over 16,000 items with new books continuing to arrive. In addition to books, there are DVD’s, books-on-CD, magazines, and book club kits. Onsite library services also include free Wi-Fi, inexpensive printing and faxing services, and computer use for anything from playing online games to filling out job applications. Electronic books and audiobooks are available with the Overdrive app; or you can read your favorite magazine with the RB Digital app. The Library partners with other West Michigan and more distant in-state libraries. You may have a book delivered to the Fruitport District Library from almost any library in Michigan. The Michigan eLibrary Catalog (MeLCat) provides books and databases. These databases provide information that help children with homework, adults with legal and consumer questions, and even automotive repair. Fruitport District Library hosts a weekly children’s story time, which includes a craft or activity. In addition, this year was the first official Summer Reading Program that offered participation for everyone. Over 300 people participated. We had seven programs, including the Outdoor Discovery Center from Holland brought “Animal Chorus” to Pomona Park. Meyer Music also presented “Touch-a-Tuba”. More programs are yet to come this Fall. The Library staff include three members. Beth Werking, a veteran children’s librarian, lives in Grand Haven. Erica Huyser, the Library Assistant, lives in Fruitport. Adam DeWitt, the Library Director, lives in Grant. The lower level of the Library building is being refurbished with new flooring and a fresh coat of paint. Our upper level is clean, organized, and mixes the traditional library of books and tables with modern internet technology. The Library also purchases supplies needed on a day-to-day basis. This is how the Fruitport District Library uses millage money. New materials are purchased. Membership fees are paid. Programming is planned and executed. Staff members are paid. The Library building and daily operations are kept in working order. Please come into the Fruitport District Library, and see your money at work. Find more information about the Library’s millage proposal, the Library’s budget, and other information about the Fruitport District Library on our Facebook page (search: Fruitport District Library), on our website, at www.fruitportdistrictlibrary.org, or by calling us at (231) 366-6107. Not only do I enjoy answering science questions from kids, but I also like naps, tuna fish sandwiches, and chasing lasers. I wasn’t entirely sure why I like chasing those little red dots. I asked my friend Leticia Fanucchi, a veterinarian at Washington State University. “Cats like lasers because they are predators and like to chase or hunt anything that moves fast around them,” Fanucchi said. A zipping red light that quickly switches directions might have a similar motion to a mouse or other critter. The light sort of mimics an animal scurrying around to escape its prey. Even though we cats know the laser is not an actual mouse, it triggers our predatory instinct. An instinct is something hard-wired into animals—they don’t have to learn it, they just naturally know how to do it. For example, dogs drool when they see food. Birds build nests. These are all instincts and some can help animals survive. As predators, cats also have a few other tools that are useful for survival: claws and sharp teeth. We also have good eyesight and hearing. Plus, we are pretty fast. The house cat is actually descended from a wild species of cat, including the European and African Wild Cat. These cats were big hunters. While house cats are more domesticated, we still share that instinct to hunt. Meanwhile, big cats like lions, tigers, and cheetahs have even bigger claws, teeth, and speed. Some of these animals show at least a bit of interest in laser pointers, too. It turns out cats big and small aren’t the only ones who like to chase lasers. Other animals seem to be very curious about them. Dogs will chase lasers. Some insects go a little wild when they notice a laser moving. People have even recorded fish following the light in aquariums. Biologists might call the laser a kind of superstimuli. It really draws in the animal’s attention because it’s so different from anything else going on in its environment. Unlike smart prey in nature who camouflage, the red laser point stands out. While investigating all kinds of things about cats and lasers, I discovered that house cats haven’t been playing with lasers very long. The first cats were domesticated about 4,000 years ago in ancient Egypt. Some researchers think we might have been domesticated even earlier. Lasers were only invented about sixty years ago. That might seem like a long time at first, but when you consider how long cats have been domesticated, only a small number of cats throughout history have ever played with a laser. That got me wondering how lasers work in the first place. We’ll save that question for another time. This entry was posted in Dr. Universe on October 27, 2018 by editor. A work session of the Fruitport Charter Township Board began at 6:30pm on Monday, October 8, 2018, in the township board room. At 7:03pm, Heidi Tice opened the regular meeting with the Pledge of Allegiance followed by a prayer. Also Present: 3- residents; 3- employees; 3- guests; Director of Public Safety, Brian Michelli; Director of Public Utilities. The motion by Andrea Anderson, supported by Heidi Tice, was carried unanimously, to approve the minutes of September 24 & September 28, 2018 as presented. Item 8-D: Culvert repair at Cloverville Rd. & Jensen Rd. Brian Michelli shared that Tuesday, October 9, 2018 through Friday, October 12, 2018, the Police Department will be accepting sealed bids on unclaimed bicycles; the Public Safety agreement between Fruitport Township and Sullivan Township was approved effective April 2019, in which Sullivan Township will provide $120,000 annually for services and $10,000 annually for equipment; the School Resource Officer is doing very well; a large fight occurred at the Haunted Hall at the Lakes Mall; the 911 surcharge proposal will be on the November 6th ballot and in part will provide new, up-to-date radios and MCT’s for Police and Fire Departments across the County. Ron Langlois reported the Broadway water main and street reconstruction are complete and the road is now open. Other correspondences shared: Muskegon County Recycling event that will be happening October 20, 2018; Roadway Safety Law for bicycles; Snow Plow Rodeo will be October 10, 2018, Park’s Board Minutes; Muskegon County Drain Commission project totals; Safe Routes to School will be on the next agenda. 1. Ron Cooper: shared a question as to if the Township is responsible for making a contribution to road projects and suggested that Farr Rd. be made wider for pedestrians. Motion Dynamics has requested an IFT for 12 years for an expansion to its existing facility. Darryl Todd from Muskegon Area First shared that the expansion would produce 80 new jobs. Rose Dillon moved, Heidi Tice seconded, MOTION CARRIED, to adopt the resolution approving Motion Dynamics for a 5 year IFT for the expansion. Heidi Tice made a motion to put $85,000 into OPEB. The motion went unsupported. Greg Hulka moved, Andrea Anderson seconded, MOTION CARRIED, to put $50,000 into OPEB. Brian Michelli shared that the Police Department interviewed two of the Department’s current part-time officers who would be eligible for full-time placement. Officer Norris was selected to fill the position. Heidi Tice moved, Greg Hulka seconded, MOTION CARRIED, to move Officer Robert Norris into a full time position with Fruitport Police Department, effective September 24, 2018. Discussion surrounding employee health insurance took place. The topic was TABLED until the next meeting. Jeff Jacobs moved, Rose Dillon seconded, MOTION CARRIED, to approve resolution that the request be considered for approval. Discussion occurred regarding the nuisance of ongoing yard sales. The Board directed the Supervisor to request the Planning Commission to build an ordinance to address the issue, not making it restrictive, but solving the problem. 18-130 Culvert repair at Cloverville Rd. & Jensen Rd. Greg Hulka brought to the Board’s attention a culvert that has failed at Cloverville Rd. and Jensen Rd. The repair is due to cost approximately $7,818 and the Township’s portion would be $1409.00. Greg Hulka moved, Todd Dunham seconded, MOTION CARRIED, to give the Supervisor permission to move forward with the repair at a cost of approximately $1,400.00; the project must come back before the Board if changes are made. Halloween at the Hall: Trick-or-treating will be at Town Hall October 31, 2018 from 3:30pm-4:30pm. The MTA meeting will be held on Monday, October 29th at Muskegon Township Hall @ 7:00pm. The motion by Greg Hulka, supported by Heidi Tice was carried unanimously, to adjourn the meeting at 8:42pm. This entry was posted in Fruitport Township on October 25, 2018 by editor. The Michigan State Constitution of 1963, requires that all penalties collected for violations of the state penal laws be divide into court costs, statutory fees, and penal fees. The penal fines support public libraries and a county law library. “Prior year payouts have ranged from $700,000 to over $950,000 depending on the number of citations written using the state penal code and the fines levied by the court,” said Brad Slagh, Ottawa County Treasurer. Diane Kooiker, the Director of Herrick District Library in Holland, said, “Penal fine revenue is an extremely important component of library funding. Herrick District Library relies on penal fine revenue to provide physical and electronic resources, programming and services for library users”. 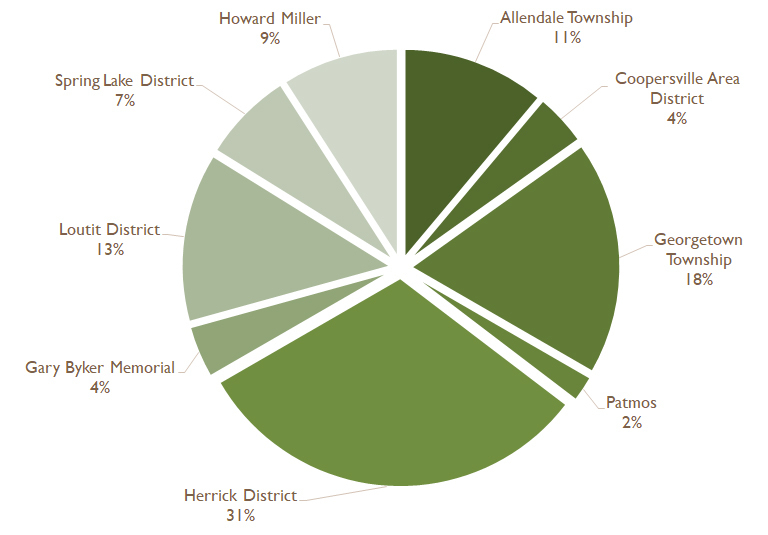 The amount paid to each public library is determined by the percentage of the county population living in the area which each library has an agreement to serve. The Library of Michigan-Department of Education dictates the eligible libraries and its associated population. This entry was posted in Ottawa County on October 25, 2018 by editor. The power of God is easily seen in His creation every where we look. It is in ourselves and all around us. His spirit is in every one of us who are alive. We are the product of the Great Designer and Creator, God. We know because He told us so in the Word of God, the Holy Bible. And He said his Word will endure forever! Regardless of Man turning science, into science fiction, as they concoct ideas about the earth and universe creation, by their billions-of-years God. Or the late Stephen Hawking’s idea that it was by the law of gravity. Others have said life started from bacteria. But the Holy Bible contains thousands of witnessed events where God displayed His Almighty power. On the first six days of creation, only God, his word, and the Holy Ghost were present. At that time God spoke the never-ending Heaven into existence, and the Earth also. The huge earth was void of life but was full of all the minerals and elements and was fully covered by water. God will then create a new Heaven and Earth. Then from Heaven, God will lower to the new Earth, “that great city, the holy Jerusalem.” The dimensions of that great walled city 1,500 miles long, 1,500 miles wide, and 1,500 miles high. “And the foundations of the wall of the city, garnished with all manner of precious stones.” With a street of gold and the presence of God and Jesus Christ for light. This entry was posted in Manuel Ybarra, Jr. on October 21, 2018 by editor. This entry was posted in Fruitport Township on October 19, 2018 by editor. Muskegon, MI—The Muskegon Museum of Art will present the sculptures of Michigan artist Nat Rosales in a one-person show from October 18, 2018 through January 13, 2019. 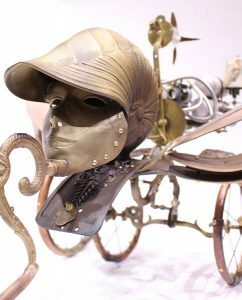 FantasMenagerie: The Art of Nat Rosales features the fantastical vehicles and creatures Rosales creates from scrap metal, found and manipulated objects, and mechanical parts. 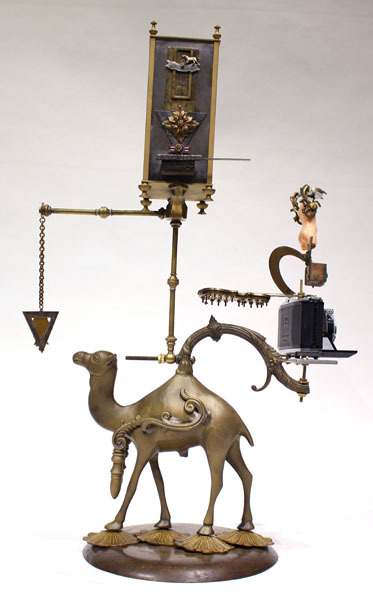 The MMA invites the public to an opening reception Thursday, October 18 at 5:30 pm. The artist will talk about his work in a program starting at 7:00 pm. The event is free. 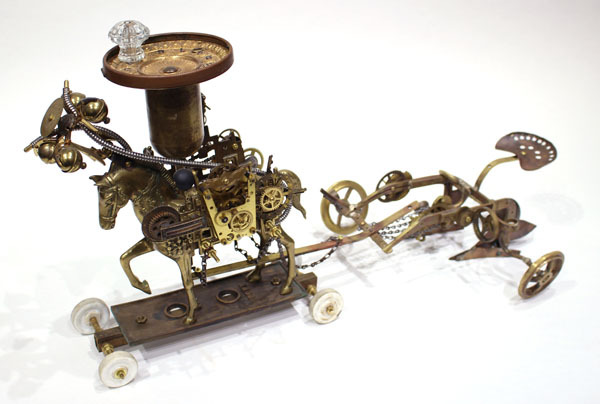 FantasMenagerie features over a dozen of Rosales’ recent works, a menagerie of vehicles, contraptions, and mechanical-animal hybrids. Formed from found objects and scrap, and inspired by Rosales’ life and culture, these fantastical creations invite the viewer along on a journey of magic and exploration. Rosales has been drawn to sculpture since childhood, an ideal expression for his fascination with taking things apart and exploring how the resulting pieces might be reconfigured and assembled. 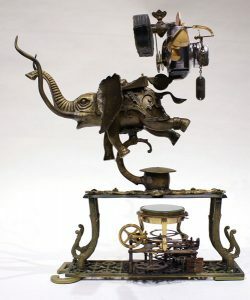 His current body of work began in 2004, with one of his earliest creations, Hog I, appearing in the Muskegon Museum of Art’s annual juried Regional Exhibition in 2005. His Mexican and Catholic heritage combine with a life-long interest in Cubist and Modern sculpture to form the foundation of his artistic expression. Nat Rosales will make a second appearance at the MMA in a gallery “Crash Course” on Thursday, November 8 from 6:00 to 7:00 pm. He will point out features of his works in the show and discuss his techniques at this free public event. FantasMenagerie is underwritten by the Van Kampen Boyer Molinari Foundation. The Michigan Artist Series Media Sponsor is Blue Lake Public Radio. Additional support is provided by the Michigan Council for Arts and Humanities, an affiliate of the National Endowment for the Arts. The Muskegon Museum of Art is located in downtown Muskegon at 296 W. Webster Ave. Visit www.muskegonartmuseum.org or call 231-720-2570 for more information. This entry was posted in News Releases on October 17, 2018 by editor. The Fruitport District Library Board would like to invite you to a meeting to discuss the millage proposal that will be on the November 6, 2018 ballot. This entry was posted in Fruitport Library on October 16, 2018 by editor. “Truth: Works By Brenda Beerhorst and Cathy Marashi” will be on exhibit in Muskegon Community College’s Overbrook Art Gallery through October 25. Admission is free and the gallery hours are Monday-Friday from 9:00am – 4:00pm with special weekend and evening hours during performances and concerts in the adjacent Overbrook Theater. For more information, contact the MCC Arts and Humanities Department at (231) 777-0324. Monday, October 15 from 12:00pm – 1:00pm, come to the Muskegon Innovation Hub for a Marketing Monday! The theme will be “Business to Business Branding & Marketing.” A company that markets its products and services to other businesses must take a different approach than an entity that is marketing to consumers. Conducted by Randy Borns of Borns LLC. The cost is $10 and you will need to pre-register at eventbrite.com. No walk-ins, no exceptions. For more information, call 616-331-6900. Monday, October 15 from 6:00pm – 7:00pm, take your creativity to the mic! Whether you want to read poetry, sing, play music or perform comedy, they want to hear you at Hackley Public Library! If you prefer to be a listener in the audience, that’s great too! Join them to see and listen to the local talent of Muskegon (no registration needed for listeners/viewers). If you wish to perform, please register by calling the HPL reference desk at (231) 722-8011, or visiting their online event calendar. When registering through their online calendar event, feel free to write what you wish to perform in the ‘notes’ section. Walk-in performers will also be welcome! The Lakeside District is having their annual Lakeside Emporium Autumn Fest! This fall celebration happens October 16 – 20 and culminates with the 3rd Annual Lakeside Emporium Sweetest Day Parade! In addition to being tons of fun, it will also be a “harvest” for those in need in the community. Participants and those who attend are asked to bring non-perishable food items and new or unused winter wear, such as gloves, mittens, scarves or hats for distribution to area food banks and shelters. The parade will feature musical groups, marching units and decorated vehicles. This will be a ‘sweet’ opportunity for organizations and individuals to come together to celebrate the fall harvest by giving to those in need. The parade is Saturday, October 20 with a 9:30am step-off time. It begins at the Grand Trunk parking area at the foot of McCracken, then heads east down Lakeshore Dr., then into the Lakeside Emporium parking lot. If you have a group and are interested in participating, please call Laureen at 231-755-9933 as soon as possible. The Muskegon Farmers’ Market is more than a market, it’s an experience! The summer market season for 2018 is May – November from 8:00am – 2:00pm, Tuesday, Thursdays and Saturdays. The Flea Market at the Muskegon Farmers’ Market is every Wednesday, May – October from 8:00am – 2:00pm. For more information, call (231)722-3251 or visit www.muskegonfarmersmarket.com. Through October 27 on Saturdays from 10:00am – 5:00pm and Tuesdays and Wednesdays from 4:00pm – 7:00pm, Weesie’s Brothers Garden Center & Landscaping invites you to join them for Spookley the Square Pumpkin Fall Activities! Weesie’s is spreading Halloween cheer and bringing awareness to the issues of bullying and how to put an end to it! Come join the fun at their Montague location featuring Spookley Trail Rides and Pumpkin Patch Wagon Rides where you can pick your own pumpkin straight from the patch! Be sure to visit Spookley’s Playground with new attractions and activities. It’s lots of fun for the whole family! Rain may delay or cancel some activities, so be sure to call ahead of time at 231-894-4742 if the weather is bad. The last wagon to the pumpkin patch leaves at 4:30pm on Saturdays and 6:30pm on Tuesdays and Wednesdays. The cost is 6 per person and includes all activities and a pumpkin. Spookley the Square Pumpkin tells the story of a square pumpkin who lives in a round pumpkin patch. Spookley initially faces ridicule from the other pumpkins for being different. Then, one night during a terrible storm, Spookley saves the other pumpkins and they learn that what makes you different is what makes you special. His story, available as both a book and DVD, delivers a message of tolerance and kindness in a fun format for kids. Tuesday, October 16 from 6:00pm – 8:00pm, you’re invited to Smash Wine Bar & Bistro for Wine Tasting Night! This month you’ll taste 4 bourbon or rum barrel aged wines. Wine specialist, Kara, will walk you through the fun and unique ways these wines were made. Seating is limited for this event, so be sure to get your tickets soon. The cost is $25 plus fee. For more information, call (231) 246-7910. To buy tickets, visit www.smashwinebar.com. Carr-Fles Planetarium, room 135: “Oasis in Space” transports the audience on a startling and beautiful voyage through our universe, galaxy, and solar system in search of liquid water, a key ingredient for life on Earth. This 35-minute program will run August 28 – October 30 on Tuesdays and Thursdays at 7:00pm. No reservations are needed. John Bartley Science Museum, room 141: (across the hall from the planetarium) has new exhibits on electricity and magnetism. Open 9:00am – 4:00pm on Mondays and Wednesdays, and 9:00am – 7:00pm on Tuesdays and Thursdays so you can visit before the planetarium show. Fridays are by appointment only. For more information, or to schedule a free, private visit for your group, call (231) 777-0289 or email tamera.owens@muskegoncc.edu. Tuesday, October 16 from 7:30pm – 9:30pm, enjoy Jazz at the Watermark 920! Gather with friends to enjoy live music as Muskegon legend and drummer Tim Froncek leads the Truth in Jazz Orchestra. There’ll be great food by Fatty Lumpkins and a cash bar. TIJO will debut a couple of new charts they have been working on and alumnus, Mike Truszkowski, will be subbing on the trumpet! The cover charge is $5 or $2 for students with ID. For more information, call the Watermark 920 at (231) 578-0469. Wednesday, October 17 from 6:00pm – 8:00pm, come to the Muskegon Museum of Art to enjoy a free screening of the film “The Drop” as part of Muskegon Community College’s ahFest (Arts and Humanities Festival)! Bob Saginowski (Tom Hardy) tends bar in his cousin’s pub and looks the other way when local mobsters use the joint as a temporary bank. His simple life takes a complicated turn when he finds a battered puppy. He asks his neighbor Nadia (Noomi Rapace) for help nursing it back to health, and a mutual attraction sparks between them. However, a robbery at the bar and the return of Nadia’s abusive ex force Bob to face the truth about those he thinks he knows best—including himself. Directed by Michael R. Roskam. A Muskegon Community College instructor will introduce the film. Film admission, popcorn and cider are free. Wine and beer will be available for purchase. Auditorium doors close at 6:00pm. For more information, call 231-720-2570. October 18 from 5:30pm – 8:00pm, come to the Muskegon Museum of Art for the Nat Rosales Fantasmenagerie Opening Event! Celebrate the opening of this fantastical autumn exhibition as Nat Rosales talks about his work in a program following the reception. This event is free and open to the public and will have a cash bar. For more information, call 231-720-2570. Join swing dance instructor, Becky Biesiada, at SE4SONS for a series of 3 classes in October! This is a fun opportunity to learn something new! Don’t forget to check out SE4SONS Gastropub after class for great Happy Hour deals! Classes are limited to the first 30 participants. Everyone is welcome and you do not need to be a Muskegon CC Member to participate. Call 231-755-3737 for reservations today! Friday and Saturday, October 19 – 20 from 9:00am – 4:00pm, it’s the West Michigan Vintage Market! Offering over 10,000 sq. ft. filled with amazing curators, local food vendors and artisans featuring shabby chic decor, mid-century modern and re-purposed furniture, boutiques, upscale fashions and so much more. For more information, follow them on Facebook or visit www.westmichiganvintagemarket.com. The Lakeshore Museum Center’s trebuchet (a type of catapult, a common type of siege engine which uses a swinging arm to throw a projectile) will be back by popular demand! Friday, October 19 from 5:30pm – 7:30pm, kids can paint their own pumpkin (while supplies last), then take it home or smash it with the museum’s catapult! They will also be celebrating the opening of their newest exhibit, “Collection by Color.” Be one of the first to explore the exhibit and enjoy learning more about pumpkins and the color orange! This event is free for Muskegon County residents and museum members, or just $3 for non-residents. For more information, call (231) 722-0278 or visit www.lakeshoremuseum.org. October 19, 20, 26 and 27 from dusk until 11:00pm, enjoy the haunted trail that has been voted the scariest in West Michigan, the Trail of Terror in Holton! Tickets are $14, or $19 for VIP tickets. Credit cards are accepted. This trail is open to all ages, but parental discretion is advised. Those with heart conditions are strongly cautioned. For more information, call 231-821-2234. Friday night, October 19 from 7:00pm – 8:30pm, you’re invited to the Hackley & Hume Historic Site for an All Access Tour! Go where no visitor has gone before as you explore what’s behind closed doors including attics, porches, and basements of both houses. The third Friday of the month, enjoy and experience different themed topics such as restoration, preservation, family stories, new discoveries in the research, Hackley House during the Red Cross, and Hume as a Daycare Center, and future projects. The cost is $20 for non-members or $15 for members. RSVP is required, but they will accept walk-ins if there is room. They will accept 15 people on the tour, but if they have a lot of interest, they will be able to accommodate 30 people. To reserve a spot on the All Access Tour, contact Aaron Mace at aaron@lakeshoremuseum.org or 231-724-5534. Haunted Hall 2018 is excited to be at the Lakes Mall again! Open Fridays and Saturdays in October from 7:00pm – 11:00pm, the cost is $15 for FOUR haunts! If you bring in non-perishable food goods for Love, Inc. you will receive a $1 discount per item, with a limit of three items. They HIGHLY recommend people follow them on Facebook to receive notifications of special deals and ticket giveaways! FAQ’s can be found on their website at www.hauntedhall.com. Not necessarily for the criminally insane – more like for TB patients, special need folks, or those society wanted to forget. Have underground tunnels (old campuses used to have them to connect to areas). They also tended to have some sort of industrial area or workshop that patients could work in, with ours being a meat-packing plant. The tunnels and meat-packing plant had a torture area. They were also used to dispose of patients who died. On a lighter note, in order to prevent the patients from rebelling, the hospital made sure to provide entertainment, this year in the form of a 3D Circus! Have a song you’ve been practicing? A poem you want to share? Dance moves? Jokes? Friday, October 19 from 7:00pm – 9:00pm, it’s time for another Red Lotus Center for the Arts Open Mic Night! Come out and show off your stuff or just sit and be amazed, your choice! Any kind of talent is welcome –– songs, poems, readings, comedy, plays, dancing or whatever other skill you want to show off. They only ask that everyone remain mostly clothed and you don’t burn the place down. Disney’s Aladdin, Jr. is based on the 1992 Academy-Award®-winning film and the 2014 hit Broadway show about the “diamond in the rough” street rat that learns that his true worth lies deep within. The story you know and love has been given the royal treatment! Aladdin and his three friends, Babkak, Omar, and Kassim, are down on their luck until Aladdin discovers a magic lamp and the Genie who has the power to grant three wishes. Wanting to earn the respect of the princess, Jasmine, Aladdin embarks on an adventure that will test his will and his moral character. With expanded characters, new songs, and more thrills, this new adaptation of the beloved story will open up “a whole new world” for their Penguin artists! For more information, call the box office at 231-727-8001. Gather your family and friends to experience the vibrant fall colors at the Depot-to-Depot Fall Color Tour! This free self-guided tour happens the first three Saturdays in October from 10:00am – 4:00pm. “Color Tourers” can pick up a map at either the Muskegon County Convention & Visitors Bureau located in the historic Union Depot at 610 W. Western Ave. in downtown Muskegon or at the White Lake Area Chamber/CVB at the Whitehall Depot 124 W. Hanson St. in downtown Whitehall. Using the map as a guide you’ll have the opportunity to visit stops along the way to win great prizes! Refreshments will be served at both the Muskegon and Whitehall Depots and kids will receive a free pumpkin that they can decorate on-the-spot. For more information call 231-724-3100. Learn the fun of making your own pizza dough and a homemade marinara sauce for the start of a good pizza. Find out how to make an herbed crusted, stuffed crust and even a cinnamon crust for a sweet treat fruit pizza. Choose and add your own toppings for pizzas that can be eaten in class or taken home to share and enjoy later. The cost is $35. For more information, call (231) 769-2202 or visit www.Eventbrite.com to sign up. Saturday, October 20 from 10:00am – 4:00pm, come to the Muskegon Museum of Art for the Appraisal Fair! Appraisers from DuMouchelle Art Galleries Co., Detroit, will be on hand to evaluate collectibles, jewelry, and antiques, combining decades of professional experience in many areas. DuMouchelle appraisers also appear on Antiques Roadshow. Appraisers will offer verbal evaluations for $15 per item or set of items ($12 for MMA members). The fee includes museum gallery admission ($8-$10 value). Written appraisals cannot be provided at this event, but Appraisal Fair is an inexpensive opportunity that can help you know if it would be worthwhile to pay to get a written appraisal on an item for sales or insurance reasons. For more information, call 231-720-2570. Prospective students from 9th grade and up, adults, and current students are encouraged to attend the Muskegon Community College EXPO, formerly called Taste of Tomorrow, on Saturday, October 20, from 11:30am – 1:30pm on the main campus. Whether you’re graduating from high school or changing your career, get help mapping out your future from their faculty and staff that will be on hand to provide information. Be sure to register at the event for a chance at great prizes, including a two-year scholarship to attend MCC. The Muskegon Community College EXPO allows attendees more flexibility to consider career options, more personal attention, and more information about MCC programs, degrees, and certificates. Explore the many educational possibilities that the college offers. For more information, contact the MCC Office of Community Outreach at (231) 777-0422. The Michigan Lighthouse Conservancy is offering tours of the Muskegon South Pierhead Light Saturdays in October from 3:30pm – 6:00pm. The cost is $2 for kids under 12, $3 for veterans and active duty military, and $4 for adults. Private tours can be arranged for $50 per person. For more information, call 844-MLIGHTS or visit www.muskegonlights.org. Aquastar is the new name of the Muskegon Lake-based cruise boat formerly known as the Port City Princess! Hop aboard and get away from the world for an hour and a half as you explore beautiful Lake Michigan and Muskegon Lake on an afternoon or sunset cruise. As always, a cash bar and light snacks will be available. The ticket price is $15. Kids under 10 are admitted free with adults. For more information or tickets, visit their website at https://aquastarcruises.com/ or call 231-903-0669. Sunday, October 21 from 1:00pm – 4:00pm, you’re invited to the beautiful Muskegon Country Club for the Lakeshore Bridal Expo, the premiere fall bridal show in the Muskegon area. The show features nearly 40 local wedding professionals. For more information, call (231) 343-3188. Sunday, October 21 from 1:00pm – 5:00pm, you’re invited to a “Howloween Open House” at Howling Timbers Animal Sanctuary! Meet their amazing animals and enjoy hayrides, a petting farm, face painting, games, prizes, refreshments and more. Admission is $20 for adults and $5 for children. For more information, call (231) 736-0018. The mission of Howling Timbers is to provide life-long sanctuary to wolves, wolf-dogs, farm and exotic animals that have been neglected, abused, abandoned or relinquished by their previous owner. Also, to assist humane societies, animal shelters and the Michigan Department of Agriculture with the placement of wolf dogs and exotic animals and to educate the public on proper care and humane treatment of all animal species. There will be book, wine and beer sales as well as live music in the lobby. For more information, call 231-727-8001. This entry was posted in Calendar of Events on October 15, 2018 by editor. 1. Discussion was held regarding a reproductive health curriculum issue that will not require Board action. 2. Information was given on Personnel Committee matters including recent tentative agreements on several contracts, Early Childhood staff salaries, and a merit pay proposal. 3. A change order that will require Board action was discussed. This entry was posted in Fruitport Schools on October 13, 2018 by editor. 1. Tentative agreements regarding Transportation/Food Service, Affiliated Administrators, and Clerical were reviewed with a recommendation from the Committee for Board action. 2. Non-affiliate staff pay increases were reviewed with a recommendation from the Committee for Board action. 3. Pay increases for Early Childhood Center staff were reviewed with a recommendation from the Committee for Board action. 4. An increase of $4.00/week/child for Early Childhood day care was reviewed and will be recommended for action by the Business and Finance Committee. 5. A change order for the high school construction project was reviewed and will be on the upcoming Board agenda for action. 6. FCS has approximately 30 students that are considered English as a Second Language (ESL). To comply with federal law, we must have an ESL teacher and therefore the position has been posted. Once a qualified and certified ESL is found, the Committee gave permission to move forward with filling this position. It will be ½ time or less. 7. Last year’s merit pay proposal for teachers and building administrators was reviewed and it was recommended to move forward with that proposal again with minor tweaks as presented. Paul Matz from Rehmann presented the outcome of the 2017-18 financial audit. The presented audit consisted of zero findings and zero comments. Mark gave an update on Fruitport’s cash flow. Mark and Fifth Third agreed upon a loan of $500,000 for two months. The interest rate was 2.56% and should cost the district roughly $3,000 which includes legal fees. Mark explained the tentative agreements that were reached with the Clerical Association, Affiliated-Admin Association and the Transportation-Food Service Association. Each agreement is a three year deal with a formula included. Mark also discussed the non-affiliated and ECC increases. The tentative agreements, non-affiliated, and ECC increases will be on the personnel agenda. Mark presented a letter from Pam Bergey, Director of ECC, which proposes to increase the rates by $4 per kid per week. The increase is to offset operation expenses along with salary increases given to staff. Mark and Bob explained a change order that will be on the board agenda due to it being above the $65,000 threshold. Bob and Mark presented the recommendation for merit pay for the teachers and building principals/assistant principals. Meeting adjourned at 12:34 p.m.
Monday, October 15, 2018 – 7:00 p.m.
6. High School Community Open House – Saturday, October 27, 2018, 9:00 – 11:00 a.m.
7. Fruitport Education Foundation “Fun”draiser, Saturday, November 10, 2018 @ Bella Maria’s. Doors open at 6:30 p.m. Wear your Trojan apparel for a chance to win a YETI. If you are out on the ocean, you might not feel a big temperature difference between night and day. But we do feel a bigger difference in temperature on land. Especially when conditions are clear and calm, the weather can be very warm in the afternoon and chilly by the morning. Loyd explains that land normally warms up and cools down more quickly than water. You can test this out at home. Fill up one plastic tub with sand or dirt and fill up another plastic tub with water. Put them out in the sunshine. Using a thermometer, take the temperatures of the two tubs every ten minutes for thirty minutes. Record your results to find out which one heated up faster. You may want to try this a few times just to make sure your results are accurate. Water actually absorbs at least as much energy from the sun as the land does—but water just isn’t capable of warming up as fast as land, or in your case, sand or dirt. The different types of land around the planet also impact the weather. One good example is mountains, Loyd said. The air is usually much colder if you are up high in the mountains. That’s also where we see a lot of glaciers, ice, and snow all year long. In the mountains, the air is thinner and it doesn’t trap in the heat very well. Exactly what covers that land also influences the weather. Forests, cities, plains, or deserts can absorb a lot of the sunlight that reaches them, warming the air above the land. But when land is covered in snow, much of the sunlight is reflected away instead of being absorbed into the land. This also helps keep snowy areas colder. So yes, the land, as well as the water, affects the kind of weather we experience on our planet. But the weather can also affect the land. Just think of the rain that helps plants grow on farms. Or the sun that gives plants energy they need to grow. Can you think of other ways the weather might change the land? Can you think of how these changes might shape the land over a long period of time? Send your ideas to Dr.Universe@wsu.edu. This entry was posted in Dr. Universe on October 13, 2018 by editor. Every Tuesday night at Mr. Quick’s is Cruise Nite, but this night is special. It’s the last Cruise Nite of the season and a Halloween party combined! Wear your Halloween costume for a chance to win prizes. There will be two age groups, adults and kids 12 and under. Decorate your car for a chance to win car care products. There’ll also be games for the kids. For more information, call (231) 788-2393. September 29 – October 27 on Saturdays from 10:00am – 5:00pm and Tuesdays and Wednesdays from 4:00pm – 7:00pm, Weesies Brothers Garden Center & Landscaping invites you to join them for Spookley the Square Pumpkin Fall Activities! Weesie’s is spreading Halloween cheer and bringing awareness to the issues of bullying and how to put an end to it! Come join the fun at their Montague location featuring Spookley Trail Rides and Pumpkin Patch Wagon Rides where you can pick your own pumpkin straight from the patch! Be sure to visit Spookley’s Playground with new attractions and activities. It’s lots of fun for the whole family! Rain may delay or cancel some activities so be sure to call ahead of time at 231-894-4742 if the weather is bad. The last wagon to the pumpkin patch leaves at 4:30pm on Saturdays and 6:30pm on Tuesdays and Wednesdays. The cost is 6 per person and includes all activities and a pumpkin. Come to the Muskegon Museum of Art to enjoy a free screening of the film “The Shape of Water” as part of Muskegon Community College’s ahFest (Arts and Humanities Festival)! A Muskegon Community College instructor will introduce the film. Film admission, popcorn and cider are free. Wine and beer will be available for purchase. Auditorium doors close at 6:00pm. For more information, call 231-720-2570. This fabulous night of food, fun and purses is for a great cause, bringing awareness to the issues of domestic and sexual violence. Funds raised at the event support Every Woman’s Place and survivors in West Michigan. The event features a live auction of purses, and a silent auction of luggage, jewelry, and other accessories. Prominent male supporters and community leaders take part to model purses and share the message. Together, as women change their purses, they will be changing lives of hundreds of survivors, simply with “the Power of the Purse.” Tickets are $40 each and may be purchased at www.everywomansplace.org. For only $20 per person, you can enjoy wine and appetizer stations from different parts of the world. Tasting will take place from 6:00pm – 8:00pm and they invite you to stay for dinner and to enjoy the rest of the evening! Call 231-755-3737 to reserve your spot. All tickets are prepaid. Please have credit card information ready when you call or stop by SE4SONS to purchase your tickets. See you there! Come to the Beardsley Theater for the Red House Concert Series featuring House of Hamill with Channing and Quinn! Brian Buchanan’s, of Enter the Haggis, and Rose Baldino’s, of Burning Bridget Cleary’s, collaborate on traditional and contemporary fiddle and Celtic music with irresistible harmonies with Grand Rapids based duo Channing & Quinn supporting. Tickets are $20. For more information, call 231-727-8001. Haunted Hall 2018 is excited to be at the Lakes Mall again! Open Fridays and Saturdays in October from 7:00pm – 11:00pm, the cost is $15 for FOUR haunts! If you bring in non-perishable food for Love, Inc. you will receive a $1 discount per item, with a limit of three. The Muskegon Heritage Museum is offering “Community Days” Saturday, October 13, the theme is ” Raggedy Ann’s Muskegon Connection,” featuring a Raggedy Ann Doll Show and guests from the Muskegon Sand Doller’s Doll Club. For more information, call (231) 722-1363. Join them for a fun afternoon as they raise money to support the National Kidney Foundation of Michigan. The NKFM has programs that help educate about and prevent kidney disease. So far, Unruly Brewing, Pigeon Hill Brewing Company, Racquets Downtown Grill, RAD DADS’ Tacos & Tequila Bar, and Third Street Grille have all graciously agreed to host the event. This year’s them is Pirates, so find your best pirate accessories and come see what kind of treasure they have in store. Registration and check-in begin at Noon at Unruly Brewing. Tickets are $15 before the event and $20 the day of the event. For more information, call 231-730-0263. Muskegon County residents can tour our historic sites for free! Tours include the Hackley and Hume Historic Site, the Fire Barn Museum, and the Scolnik House of the Depression Era. This is the museum’s way to say “thank you” to the residents of Muskegon County for supporting our millage each year! For more information, call 231-722-0278 or visit www.lakeshoremuseum.org. Come to the L.C. Walker Arena for a Lumberjacks’ home game as they take on the Chicago Steel! This is an extra special evening as the L C Walker Arena will celebrate the opening of their newly remodeled facility! For ticket information, contact asponaas@MuskegonLumberjacks.com or call 231-724-5225, ext. 259. Gather your family and friends to experience the vibrant Fall colors at the Depot-to-Depot Fall Color Tour! This free self-guided tour happens October 6, 13 and 20 from 10:00am – 4:00pm. “Color Tourers” can pick up a map at either the Muskegon County Convention & Visitors Bureau located in the historic Union Depot at 610 W. Western Ave. in downtown Muskegon or at the White Lake Area Chamber/CVB at the Whitehall Depot 124 W. Hanson St. in downtown Whitehall. Using the map as a guide you’ll have the opportunity to visit stops along the way to win great prizes! Refreshments will be served at both the Muskegon and Whitehall Depots and kids will receive a free pumpkin that they can decorate on-the-spot. For more information call 231-724-3100. Book your site at Muskegon State Park for October 13 to enjoy the Fall Harvest Fest! Come camp in the Channel Campground and enjoy some family fun at this annual fall festival happening from 10:00am – 8:00pm. Activities are open to registered campers and will include games, face painting, campsite decorating, a parade and prizes. A Recreation Passport is required for vehicle entry into Michigan state parks. To make a camping reservation, visit www.midnrreservations.com or call 1-800-447-2757. The Michigan Lighthouse Conservancy is offering tours of the Muskegon South Pierhead Light Saturdays in October from 1:00-5:00pm. Additionally, The cost is $2 – $4. For more information, call 844-MLIGHTS or visit www.muskegonlights.org. Saturday and Sunday, October 13 from 5:00pm – 8:00pm and October 14 from 2:00pm – 4:00pm, come to Evergreen Cemetery for the 9th Annual City of the Dead! This annual, family-friendly event features actors from Harbor Unitarian Universalist Congregation portraying the figures that are prominent in Muskegon’s history at their burial places. The City of the Dead highlights Muskegon’s industrial and entrepreneurial past and seeks to accurately portray the people who shaped this city. Period games and traditions are also demonstrated when appropriate to the people portrayed. Tickets are $5, with children 6 and under admitted free. For more information, visit their Facebook page. Join the Muskegon Museum of Art for a free family fun day! They are excited to celebrate dolls with their neighbors at the Muskegon Heritage Museum and Lakeshore Museum Center! Grab your favorite doll and join them for a fun day! For more information, call 231-720-2570. • 11:00am – 1:00pm/Guided Look: Explore the galleries with a MMA docent! • 11:00am – 2:00pm/Make and Take Paper Dolls: Did you know Raggedy Ann was created here in Muskegon? Create your own Raggedy Ann paper doll in the classroom with us! Pumpkinfest includes a full-day of family-friendly and many pumpkin-inspired events and contests including the pumpkin roll, pumpkin painting and carving, pumpkin seed spitting contest, pumpkin weigh-ins, hay rides, bake sale, apple cider mill, face painting, food vendors, Farmer’s Market, Arts & Crafts fair, and more! The Arts and Crafts Festival runs from 10:00am – 4:00pm with crafters displaying a variety of goods. Shop the marketplace with various vendors and artists selling items including holiday decorations, jewelry, clothing, photography, wood crafts, food dips, and more. Also, visit the Farmer’s Market and the apple cider mill, along with local food vendors for a variety of fall foods and decorations. For more information, call (231) 893-4585. Enjoy the one-day exhibit, “Dolls Through Time,” at the Lakeshore Museum Center. Inspired by the 100th Anniversary of Raggedy Ann, this is a joint event with the Muskegon Heritage Museum and the Muskegon Museum of Art. Children are encouraged to bring their own dolls for a photo-op with some of the museum’s historic dolls; then stick around to make a doll craft! This event is free for museum members and Muskegon County residents, or just $3 for non-residents. For more information, call (231) 722-0278 or visit www.lakeshoremuseum.org. Muskegon Community College’s Center for Experiential Learning will host “Politics in the Park,” a candidates’ forum in downtown Muskegon’s historic Hackley Park on Saturday, October 13, from 12:30pm – 3:30pm. The event, which will be held rain or shine, is free and the public is encouraged to attend. Spectators should being their own lawn chairs as no seating will be provided. The invited candidates are: 2nd U.S. Congressional District Candidates, Bill Huizenga and Rob Davidson; 34th Senate District Candidates, Jon Bumstead, Max Rieske and Poppy Sias-Hernandez; 91st State Legislative District Candidates, Greg VanWoerkom and Tanya Cabala; and 92nd State Legislative District Candidates, Terry Sabo and Gail Eichorst. “Utilizing a tried-and-true format which heralds back to the Lincoln-Douglas Debates of 1858, the moderated forum will focus on a number of topics which a potential leader will face at either the federal or state level,” explained MCC faculty member George Maniates. “Candidates will be presented with a topic and they can inform the public about their stances and concerns which they will face.” The topics will be generated by the staff of the MCC Center for Experiential Learning and presented to the various candidates a week before the forum. The list of topics will be drawn at the forum by the moderator from a pool of sealed envelopes. Candidates will be timed and will have three minutes to answer each question. “The voters have clearly made us aware they are not interested in ‘sound bites’ or ‘poll stances’ but in well-thought and substantive policy plans,” continued Maniates. “They want to hear about solutions or efforts which the candidate will take if she or he is elected to office.” For more information, contact the MCC Center for Experiential Learning at (231) 777- 0380. Muskegon YMCA Camp Pendalouan invites you to attend their annual “Penda-Luau Alumni & Friend Fundraiser!” 1243 E. Fruitvale Rd., Montague. Sponsored by friends of Camp Pendalouan, this event will raise funds for facility improvements. Registration is free, although there is a recommended $20 per family donation. The fundraiser begins at 2:00pm and includes fun activities such as the climbing wall and zipline. You’ll also enjoy boating and luau-themed beach competitions along beautiful Big Blue Lake! Local beer, wine and specialty drinks will be available. A donation basket, silent auction and Booze Pull will be set up in the Nikana Lodge to raise funds for the Sports Field / Parking Lot project. The bigger the take, the more improvements they can make! Following the activities, participants are invited to a complimentary pig roast and entertainment! Auction winners will be awarded at this time. For more information, to register, or to give online, please visit www.pendalouan.org. Come to the L.C. Walker Arena for a Lumberjacks’ home game as they take on the Youngstown Phantomsl ! This is an extra special evening as the L C Walker Arena will celebrate the opening of their newly remodeled facility! For ticket information, contact asponaas@MuskegonLumberjacks.com or call 231-724-5225, ext. 259. This entry was posted in Calendar of Events on October 8, 2018 by editor. Towards the end of his life, my father and I would spend evenings on the balcony of his home in Saint George, Utah where he had retired fifteen years earlier. “Why would you want to leave all this beauty?” he would ask, gazing east to the red sandstone mountains as the sun set behind his home. The sunbeams cast an ever-changing light show, more beautiful than words can describe. What did my dad expect me to say? How could I express to him what I felt? Yes, I’d been raised to hate the state. For decades the man complained about sticky heat whenever he was doing yardwork or repairing the barn. In the winter he would put an electric heater into his car to knock off the chill before driving to work in the pre-dawn hours. In the desert, all I could see was drying grass and a lack of trees. Year after year I would start a garden, just to watch it dry up. Some years I would have a little success at the start. Then just as my tomatoes, green and plump, would look like they had some hope, a sandstorm would raze Saint George, scouring my little plants down to one inch nubs. Finally I just gave up. Growing a garden in the desert wasn’t worth the tears. I went to a couple reservoirs because I love to swim in lakes. I tried to make the best of it, but it just wasn’t the same; not by a long shot. She had a look of amazement and spent a long time playing with her little sister May on the shore. More than once she would stop to gaze at the horizon, awestruck. I’d spent five years trying to love the desert. Now that I was back in my home state of Michigan, I realized I’d been gone for too long. My birth took place at Zieger Hospital in Detroit. My own babies each came into the world along the Detroit River: Kay at Wyandotte General Hospital and May at Riverside Osteopathic in Trenton. It’s as if the river is flowing in my blood! Each season in the Great Lakes has its own splendor. Fun for me growing up was lightning bugs, jumping into piles of leaves, building snowmen. My memories were filled with watching freighters gliding up and down the Detroit River, fishing with my father, and sitting on his shoulders watching boat races. I can’t do any of those things in the desert. Still, with the urging of family and a heavy dose of anti-Midwest brainwashing, my husband and I made the move to St. George, Utah. The first thing Kay and May did in our new sandy backyard was dance in a sudden unexpected downpour. The monsoon had come. All the way to the desert and my kids played in the rain! Then I’d explain that since mid-May it was 90 degrees and then 100 degrees plus in June. As soon as we got into July and August, the hottest months at about 115° to 118°, the rains started up, mainly in the surrounding mountains. This added humidity to the weather. Many times we had to deal with the mugginess, but no rain, unless it came in the form of a downpour resulting in a flash flood. That first summer we lost a couple hens to the heat and a rabbit, too. To sum it up, when someone says, “At least you have a dry heat out there in the desert,” it’s all I can do not to reach out and slap the assuming face those words come from. So, now that I am back in Michigan, I breathe in the moist air and give thanks for the woods, four seasons, and the Great Lakes. After all, I was raised in all this grandeur. I just didn’t appreciate it when I was a child. I am back to stay. It is with great pleasure and satisfaction, that I now call west Michigan my home. I had to journey through desert Hell to return to my first love here in the Great Lakes. Maybe some folks don’t feel the same way that I do, but I am willing to bet many people reading this will smile – and agree. This entry was posted in Local Writers on October 8, 2018 by editor. Dear Dr. Universe: How do some trees survive after being burned in a wildfire? There are a few ways they can survive, says my friend Andy Perleberg. He’s a forestry expert at Washington State University. One thing that protects trees from wildfire is thick bark. In Washington state, the most common trees with really thick bark are the western larch and ponderosa pine. Ponderosa pine actually has jigsaw-puzzle shaped pieces of bark. Maybe you have seen these in your neighborhood. Some people call the pieces “scales,” Perleberg said. When on fire, these scales peel back and fall to the floor, taking the fire back to the ground. The tree makes sugar—its food– through a process called photosynthesis. Under the bark is a very important part of the tree that helps the tree mobilize sugar called the phloem. It helps move sugars around the tree and to the roots. The thick layer of bark also helps protect the tree’s food-processing system from fire and other damage so it can get the energy it needs to survive. When a fire happens, some trees will release a kind of sticky, honey-like substance called sap, or pitch. The pitch will flow into cracks where fire could reach that very fragile phloem. It’s kind of like smearing putty over a crack in a wall, Perleberg adds. This leaves the tree with a fire scar, he says, but the tree survives and keeps growing. Fire ecologists can use these fire scars to trace the patterns of historic fires and how often they happened. Sometimes, fires occur naturally through lightning strikes. Sometimes, fires are man-made, and Native Americans traditionally burned areas to help people survive, encourage certain plants and keep ecosystems healthy. Some trees have also adapted to shed their lower limbs. As the tree grows higher and higher, some limbs don’t grow anymore. The fire can’t climb up the tree as quickly without the source of fuel to help it along. After a fire, the trees left standing likely had thick bark or another one of these adaptations. Meanwhile, the rest of the dead trees will also have a new purpose in life. Dead trees and old plants that turn into ash return important things, called nutrients, to the soil. The old trees also become habitats to some kinds of wildlife that live in the forest. Bark beetles like the weak trees and go in to eat the sugary layer beneath the bark. Other critters, like flying squirrels or tree frogs, might turn a dead tree into their new home in the forest. This entry was posted in Dr. Universe on October 6, 2018 by editor.